Two years ago I found this fellow on one of our fuchsias . . . 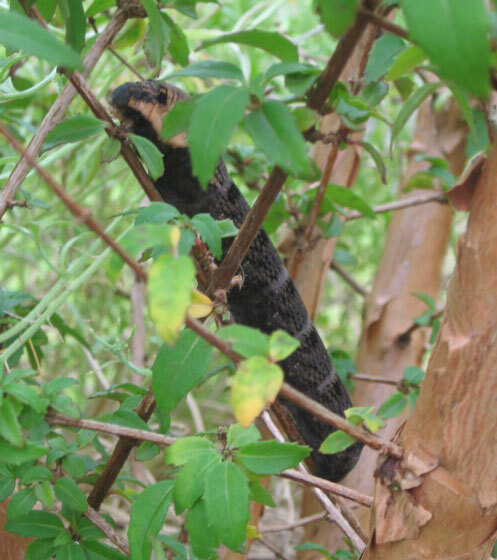 This year we found this chap (or lady) on a different fuchisa bush . . . This bears out what the books say about elephant hawk moths liking fuchsias . . . These fuchsia leaves are tasty! He was still chomping away a few days later . . .
. . . so perhaps next summer we’ll see him as an adult? Posted in wild and gardens. Tagged with elephant hawk moth caterpillar, fuchsia. these big buggers have eaten all my fuschias how do we get rid of them ? You must have loads of them. Never had a problem with them before. We have found 3 in the garden this morning alone. They are really horrible. How do we get rid of them? Currently my kids are throwing them over the hedge!!!! sorry neighbours…. Shame, they grow into beautiful moths. I cannot understand why you would want to get rid of them in the first place! I first saw one of the E.H.Moth caterpillars this year and i was stunned by there beauty, they are marvelous insects, you should count yourself lucky that you get to expierience so many of them, if i lived nextdoor to you i would quiet happelly take them of your hands and put them into my garden and look after them all, and when they have done pupating and turn into adult moths you get to see the real beauty, theres no need to kill them there quiet rare and not very common in most gardens, so please don’t throw them around and think nothing of them, learn more about the whole cycle of moths especially E.H.Moths and you will begin to enjoy them. 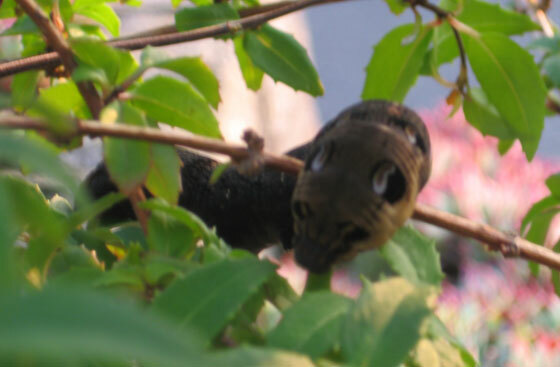 Thank you for your information above, I found 5 elephant hawk moths on my fuschia bush, or should I say our dog did. I have never seen these caterpillars before let alone the moth that laid her eggs. I feel very honoured that she chose our garden. I checked this morning and they are happy munching away. 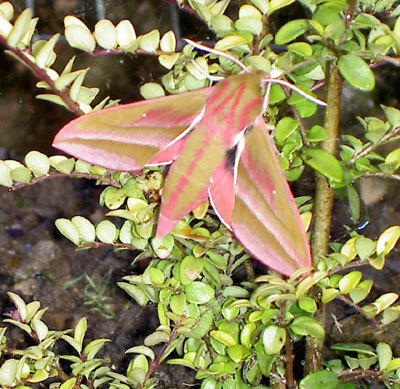 Just found an Elephant Hawk moth in my garden in South Wales. Never seen one before ! They are quite remarkable. I wondered what is was the first time I saw one. Our youngest dog kept bringing in a caterpillar and we had to rescue it and put it outside again. Not seen any this year, but they do seem to love fuchsias. I have found an elephant hawk moth on my fushia but would like to see him or her grow, what shall i do can i keep him indoors in a butterfly house ?? I don’t know. I’m sure it will find somewhere to spend the winter and next year you will see it as a moth. Tragic that the first thing so many people think of is how to get rid of anything which is out of the ordinary. These (and all moths) are glorious creatures – learn to appreciate the natural world and wonder at it. And we are losing species of moths and butterflies all the time. They are are indeed glorious and we should appreciate them. 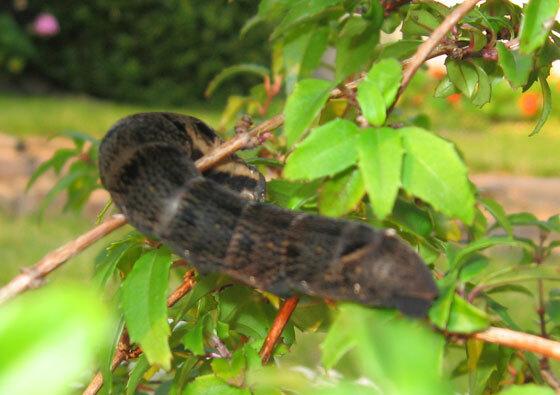 I found one of the huge elephant hawk moth caterpillars a few weeks back, having read what they eat I am surprised as we have no Fuschias!!! Fantastic creature that the cat thought was fascinating and so did my son…till it crawled on his hand!! I think fuchsias are their favourites but think they can eat other plants. They are fascinating though. Hope your son was not too frightened. We used to have to rescue them from our youngest dog who treated them like pets. What an amazing looking caterpillar! Markings like a snakes head and quite huge. So pleased to identify it via your website and others comments. My one is eating the flowers and so far not touching the leaves. Wonder how it will overwinter when the plant dies back? Thanks for your comment. I’m not sure where ours overwinter. I haven’t seen any moths this year yet so hope they survived from last year. I’m not an expert, I’m afraid. I leave them outside and hope they survive. Good luck with yours! My husband and I have fuchsias in our garden and we have just found our first elephant hawk caterpillar. What a beauty!!! I went straight onto the internet to find out what it was called. I put in “caterpillars that eat fuchsias” and they came up. I can’t believe what we have found. Can’t wait to see it turn into a moth, it must be a sight, I bet we miss it. They are quite amazing. You might not see the moths until next year. We have had fuchsias in our garden for over 20 years and this is the first time I have seen a E.H. moth. It was quite a sight to see, so big. We didn’t know what it was at first until I checked it out on the web. We feel so privileged to have one in our garden. Its so beautiful. We’ve had them several years running, but have not seen any about so far this year. They are marvellous. full grown moth ,a really stunning creature. well i found a EHc caterpillar at my work and took it home as they wanted to depose of it,i’ve kept in a large tub with a few twigs and i think he’s started to pupated. Definitely what I found 2 of on my small, almost denuded, trailing fuchsias in my Bedfordshire garden. Found 2 of these caterpillars on my fuchsias at the weekend, photographed them as I thought they were so lovely – went back next day to look for them but – no sign, so disappointed, hope they are still in the garden somewhere. They have probably gone off to hibernate. Have 7 E H caterpillars on fuchsias in garden they never stop eating, have never seen them before had to go to Internet to find out about them, how long is it before they turn into moths ? I live on the isle of Wight just found one on my fuchsia can’t see any more. Thanks to your website I now know what it is and I shall leave it alone and hope it survives the winter. Wonderful creature. Hi! Our amazing EH caterpillar was found in Sept and after being popped in a butterfly habitat hanging net indoors, last night it emerged! Absolutely stunning. Concerned tho since it’s only Feb and so all it’s natural food of choice like Honeysuckle is nowhere to be seen. Any advice please to help it survive?! Would a sugar solution nectar substitute in it’s habitat suffice? Many thanks. Are they poisonous to cat’s, I have them in my garden (fuchsia) they are more than welcome to stay but my cat brought me two home one had been slightly chewed and just wondering if ill be looking at a vet bill! I don’t think so. One of dogs used to carry them around, but was OK. Hope your cat is OK.